The parts and components of a fire extinguisher, all play a vital role in the effective discharge of water or a chemical agent to suppress a fire before it can spread out of control leading to property damage and maybe even loss of life. Fire extinguishers are engineered to spray and spread an agent on a fire to remove one of the three elements necessary to maintain a fire once it has started. Those elements are the fuel that is burning, the heat that is produced, and the oxygen needed to keep the fire going. These are collectively known as the fire triangle. As such, fire extinguishers are designed to target one or more of these elements needed to sustain a fire by providing a barrier between the fuel and the oxygen in the surrounding air, or by removing the heat by cooling the fuel. If either of these can be affected or eliminated, the fire goes out. This fundamental principle of eliminating an element of the fire triangle assuredly has a distant history, but in modern times a tool to suppress fire, known as a fire extinguisher, began as a pressurized vessel that sprayed water. Understanding that certain fires were not effectively suppressed with water, that water conducts electricity making water an unacceptable agent in fighting electrical fires, that a forceful stream of water may splatter combustible materials, and that in cold temperatures the water may freeze, led those seeking to improve fire extinguishing capacity and effectiveness to develop new agents – wet chemical, dry chemical, halon, and carbon dioxide. Cylindrical Tanks: Flat on the bottom and dome shaped on top, cylindrical steel tanks contain the extinguishing agent and the propellant necessary to provide the pressure to forcibly push the fire extinguishing agent out creating a spray. Valve Assembly: The function of the valve is to control or regulate the flow of the extinguishing agent. It consists of a machined body made of metal bar stock on a lathe (or plastic injected molded part for economy versions), a handle that allows for grasping and lifting and transporting the extinguisher, a metal locking pin to prevent against accidental discharge, Plastic tamper seals to keep the locking pin from falling out, a metal release lever and a dip tube through which the agent is drawn up for expulsion. Stored pressure fire extinguishers may also contain a pressure gauge. Nozzle and/or Hose: A nozzle directs the direction of the extinguishing agent as it leaves the tank. A hose, typically found on extinguishers that are heavier than 3 kg, further allows refined directing of the flow as it leaves the extinguisher. Extinguishing Agent: The substance that limits or suppresses the spread of the fire. An understanding of the different classifications (Classes) of fires is helpful in determining which type of fire extinguisher is best for your situation. Below is a helpful chart explaining the different Classes of Fires and their unique characteristics such as their typical fuel source, the setting in which a type of fire usually occurs, and the most effective type of fire extinguisher to use in combating the fire. The second chart provides a breakdown of the various types of fire extinguishers, the firefighting agents used, their advantages/uses and disadvantages. Propellant: A gas whose function is to expel the extinguishing agent from the fire extinguisher. In stored pressure fire extinguishers, the propellent is stored in the same chamber as the fire extinguishing agent. 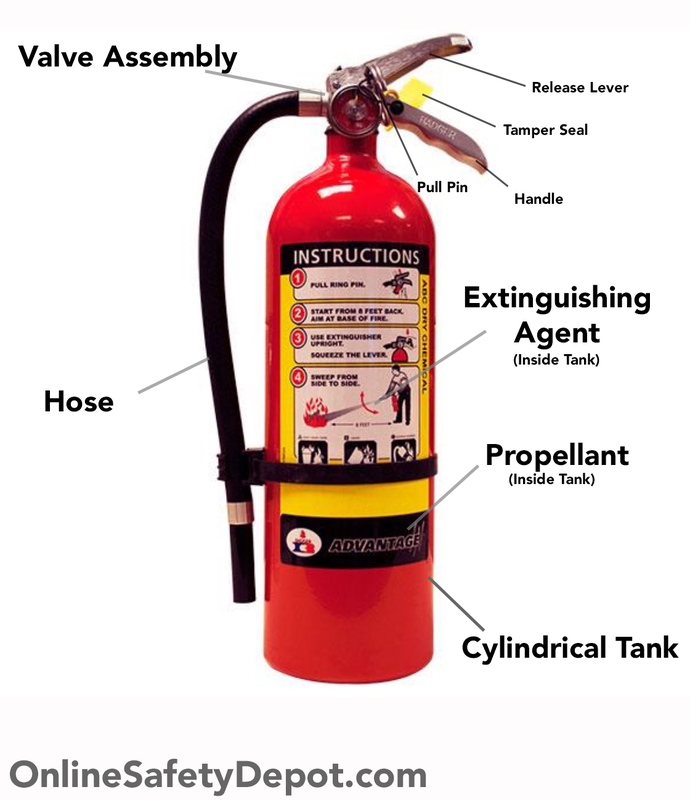 In cartridge-operated fire extinguishers the propellent is contained in a separate cartridge that is punctured when activated exposing the propellent to the extinguishing agent. Steel cylinders are treated with a galvanizing compound undercoat, baked-on enamel top coat, and protective clear coat finish to prevent corrosion and fading from exposure to sun and sea. Operating levers are made of stainless steel and valves are plated brass.